Newer, more sophisticated methods of optic nerve analysis using computerized digital imaging assist with the accuracy of the initial glaucoma diagnosis and provide a useful database of information for monitoring disease progression or stability. 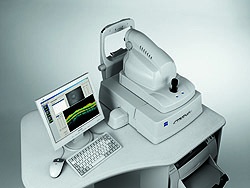 Your evaluation will include Optical Coherence Tomography (OCT), which uses special light beams that reflect off the retinal surface and are captured by the computer to create images of the optic nerve or the retinal layers around the optic nerve. The measurement of the retinal nerve fiber layer thickness around the optic nerve is of particular value in a glaucoma evaluation, since loss of nerve fibers will cause thinning of the nerve fiber layer. The Diopsys® ERG and VEP vision tests allows your Berks Eye Physicians and Surgeons doctor to objectively assess vision disorders often earlier than traditional vision tests. They use electrophysiology and proprietary software to evaluate the entire vision system from the eye to the visual cortex. Because we have this state-of-the-art technology on site, Berks Eye is able to compare tests over time to track disease progression. Diopsys® VEP tests use a technology called Visual Evoked Potential (VEP) to objectively measure the functional responses of the entire visual pathway from the anterior segment of the eye to the visual cortex. 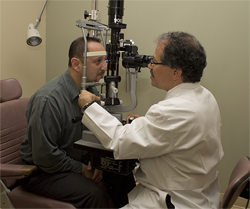 Your Berks Eye doctor may order this test to diagnose vision and optic nerve disorders such as optic neuritis in multiple sclerosis (MS) and amblyopia. Patients may also be tested to detect neuro-visual problems caused by traumatic brain injury (TBI) or stroke. Diopsys® ERG vision tests use pattern electroretinography (ERG) technology to help your Berks Eye doctor to gain objective, functional information about the performance of the inner retinal cells of the eye, especially in the macula. These vision tests are designed to provide data to the doctor to help detect dysfunction that can precede evident structural defects, thereby contributing to earlier detection for more specific and timely management of diseases that impair macula and ganglion cells.